Last week, Threadless was called out on Twitter about their decision to go from American Apparel tees to other brands. The question was replied to by the User Experience Director at Threadless. He didn’t seem to know much about it, except that the shirts he had close at hand were from Egypt and India, and that they have been using a company called Bella. A recent Threadless t-shirt order also throws Mexico into the mix. Sweatshop free? Doesn’t sound promising, but you never know. brockrumer: @sweatfreeshop Almost all our shirts are printed on Bella (girly) and Canvas (Bella’s guys line). Check ’em out and judge for yourself. sweatfreeshop: @brockrumer where is @bellaclothing manufactured? brockrumer: @sweatfreeshop Not sure about all the countries where their manufacturing is, but a couple I had close at hand were India and Egypt. Bella Clothing never replied to the tweet. 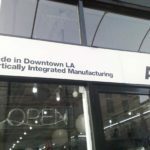 Their Twitter account boasts Los Angeles, and they have a social responsibility page on their site, but it mentions nothing about being fair-trade or sweatshop free. 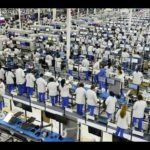 Their employees get to eat organic food and use a gym, but are they talking about their air conditioned LA office workers or their factory workers? They proudly use as much organic cotton as possible, but who cares if pesticides were on your cotton if you have the sweat of a slave on it instead? 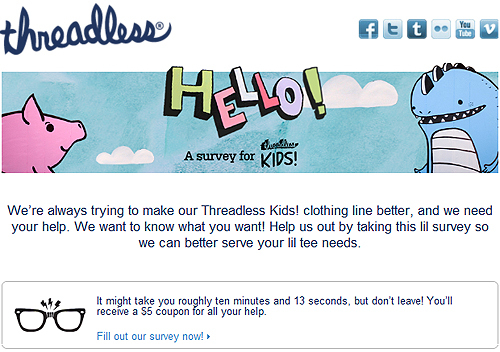 This week, Threadless sent out an email to their customers asking them to trade a few moments of their time in exchange for a $5 coupon. 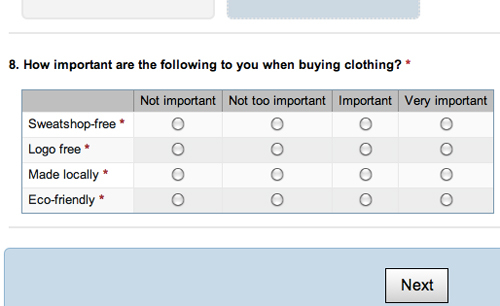 The #8 question asked customers how important sweatshop-free, logo free, made locally, eco-friendly is to them. It’s nice to see Threadless taking action after they were questioned about their choice of t-shirt manufacturers, but instead of surveying people, they should take the initiative and do the right thing on their own.